Above is a picture taken looking from the Self Realization Fellowship to the south. 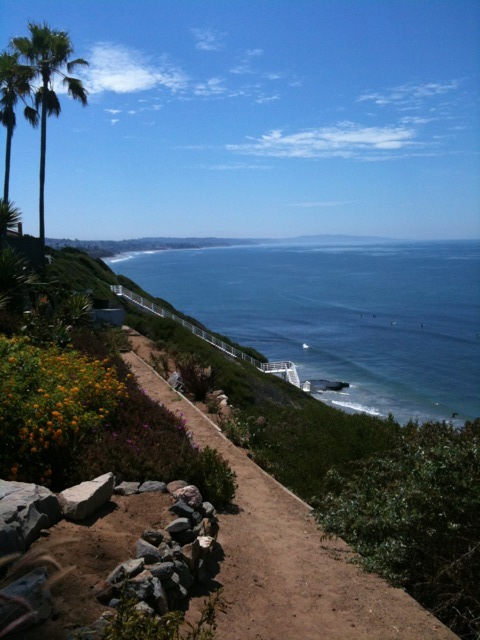 Paramahansa Yogananda was given this land on the ocean at one of the most beautiful vista points in Encinitas. The gardens here are spectacular and offer a quiet place to sit and meditate. The ocean is so calm right now and the sun so bright that the reef below is clearly visible. It is one of my favorite spots here in San Diego. If you ever have the chance to pick up a copy of Autobiography of a Yogi it is well worth reading. I personally feel that the tracks that Yogananda laid here in Encinitas is what helped pave the way for Encinitas to be the yoga capital of the world. No joke. The energy here is out of this world. I officially declare Encinitas to be one of my most favorite places ever!! Today has been a day of learning that far exceeded my expectations of what I came here to do. I am finding that I had this mental projection prior to coming that included several topics. Such as learn more about second series. Learn new techniques for adjusting. Because I have come into injury, I have had to seek help. This process has led me be to several professionals in the healing profession crossing several modalities. Massage, thai massage, acrobatic or suspended traction bodywork, acupuncture, chiropractic and energy work. All of which has really opened my eyes to greater levels of potential within this field of yoga or moving toward oneness. I am really beginning to shift my understanding of what yoga really means to me. All of this has come through the experience of pain. I remember the first time one of my original teachers said “pain is a gift.” I just could not wrap my head around that. It seemed absurd. How could discomfort be something I would want. I am continuing to see more and more that pain is just our bodies talking to us, sending a message that more or less asks us to be present and truly listen. But oh so difficult right? Especially when we are in the thick of it. I have to say that I learned more about my body yesterday by listening than I ever have by expressing movement through desire. I am so extremely thankful to my teachers and Tim is orchestrating this in such fine form I am forever grateful. I think that to give credit to Yogananda I am missing an even more important link. The Native American people have laid these tracks. I have to acknowledge the people before us and I deeply want to return to this understanding and respect for the land. While our culture holds quite a bit of karmic sorrow for those before us that we tried to dominate, I think it is time we embrace the culture that was already living what we wanted. I truly believe we are in for a big surprise moving forward. In a very positive way! This entry was posted in Uncategorized by nativeyoga. Bookmark the permalink.